Drew is a “magic man”. Those are the words of another satisfied customer. Drew fixed the broken arms of his eyeglass frame with the arms of a different frame, while I tried my new computer glasses that Drew just made. I completely agree that Drew is a “magic man”. He is a very knowledgeable and skilled optician. I wish I knew him 10 years ago when I moved to Long Island. Besides the computer glasses, he chose a perfect stylish frame that fit my face for my distance vision glasses with progressive lenses. I was not planning to get a pair of computer glasses, but Drew took the time to discuss and understand my prescription and my vision needs. I highly recommend Drew of See World Optics for anyone who wants stylish eyeglasses or needs eyeglass adjustments, but especially anyone who has a strong prescription and complicated vision needs like myself. I would like to thank Mr.Drew for his professional, expert advice, that saved me a lot of time, money and aggravation. My next pair of glasses will only be from See-World Optics. Thank you again. Broke my sunglasses arm off and took them here to get repaired, great service and I’m totally satisfied with the outcome. I have been researching for a reputable place that would be able to fix my very expensive Celine sunglasses. I came across See World Optics & all of the great reviews. I went on my lunch break yesterday, & had the pleasure of meeting Drew. He was extremely welcoming, friendly & honest. Right away he informed me that if he attempted to fix them, there was a possibility that they could crack. I told him I trusted him, and left them in his hands. He said they’d be ready the next day, however, to my surprise, there was a voicemail a few hours later from Drew, informing me that my glasses were fixed & ready. I went the next day to pick them up & tried them on. They were PERFECT! To top it off, he did it all for no charge, however I could not leave without giving him a tip! He did not want to take it, but I ran off before he could give it back :). Thank you SO much Drew! I searched by reviews on Yelp. Liked it because every review had a personal touch mentioning Drew. I called ahead for an appt yesterday, Drew the proprietor was very helpful and accommodating to my schedule for this afternoon. He explained the fees for the exam as well as a a bit about his experience in the business. Drew explained he crafts the lenses himself on site, which is unusual these days. Met Drew and was introduced to Dr. Sigman, He was quite detailed in making sure he asked all the questions to know about my vision and changes since my last check up. Shared with him about the issues I’m having. Ran all the usual tests. Told me which solutions to use with the new contacts I’m getting, never knew some are compatible while others are not. After I completed my exam, Drew and I chatted for a few. A quick note on UV and polarized eyewear. Will be back to pick up my contacts next week. I’m very pleased with the service thus far. Hopefully we will develop a life long relationship. I went to ‘See Word Optics’ a week ago to repair my Vera Wang eyeglasses – after a screw came out. Drew was welcoming, friendly, knowledgeable plus efficient as he fixed my glasses within 10 minutes. I was so worried I would have to purchase a new pair or the replacement piece would have to be ordered but since Drew makes glasses in his shop – he had what I needed. . . best of all,the service was free. Drew was great to work with! Not only can you get your eyes checked here but you can buy / create your own custom eye-wear in store. Definitely recommend this store and Drew. I needed new frames for my bifocals – difficult to find since the glasses were 3 years old. I did not want/need new lenses. Drew was able to help me to find the right frames, with my specific requirements and put together my new bifocals while I waited. Customer service was great and he told me that I can come back any time for an adjustment. Definitely found a new person for making my glasses. Highly Recommended! Excellent. Was looking online for a reliable place and my experience at this place lived up to all the wonderful reviews on yelp. He accommodated my special request and was even able to finished it a day early. No complaints here! I was so happy I came here. Called See World because my bf glasses broke – he had antique style. Spoke to Drew over the phone. He was so friendly and willing to help, even told us how to get there from Brooklyn and mentioned not to run the yellow lights on your way there cuz they were rigged (hehe). He has every sort of frame listed. He got this down packed to a science. Frames from the 70’s, 80’s, 90’s, frames made in Germany, India , as well as plastic and metal frames (real gold frames too). It was a great experience. We came out purchasing another frame and he ordered new lenses for the one we wanted to be repaired. I’ll never mind running those yellow lights to come back to See World Optics. Well worth it. Then I found Drew at See World Optics. He assured me he could fix the glasses and they would be just like new. sunglasses) and gave me fair prices for everything. He has a great selection and a great sense of what will work best. I wouldn’t even consider going anywhere else. Can’t wait to pick up my new glasses! For those of us who wear glasses and are as hard on the frames as I am, having a place where they can be expertly and quickly repaired on the spot, is an indespensible asset. Drew, of See World Optics, provides this valuable service. I have found many ways of breaking my frames but Drew always found a way to repair them, even when it seemed hopeless. Thanks to Drew, I haven’t been without my glasses for more than the five to ten minutes it took him to make them as good (or better) than new. I am indebted to him for ensuring that my vision is optimal without interruption. There is no one like him. He will give you the best service and advice because he has unmatched expertise and dedication to his craft and customers. Nothing seems to matter more than their satisfaction. If you are looking for an optician to make a pair of glasses or to repair the one you have, you will not find a better person than Drew. And you will have spent a very pleasant bit of time with a most delightful individual. I have yet to walk out of his store without feeling amazed, relieved and my spirits lifted. Excellent customer service!! Drew fixed my father’s glasses and they came out looking like new. He is honest and takes great pride in his work. Very professional. I highly recommend this place for all your optical needs. 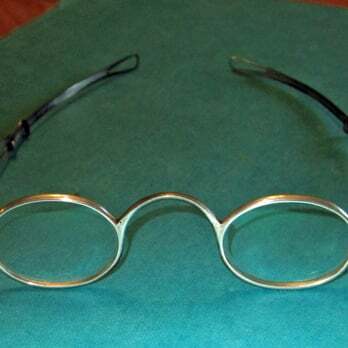 Antique frames after repair by See World Optics. My grandpa who recently returned from a trip in Pakistan, had got his glasses made there. When he returned, one of the screws went loose and the arm of the glasses completely unhinged. He couldn’t find the screw and so he asked me to take it in for a repair. So I blindly went into the closest optical shop nearest my home at around 5:45, almost closing time. I had the pleasure of speaking with Drew, the owner. As soon as I handed him the glasses, he knew they weren’t made in America. I asked how he knew, and he recognized the different screw these glasses used (the glasses’ lenses were also made of glass, and not plastic like how they are in the US). So I knew I was dealing with a pro (42 years in this field to be exact). He said it’d be hard to find the specific screw to put the glasses together but that he’ll try his best. So lo and behold, I come in the next day and the glasses look brand new again. Although he didn’t have the exact same screw, he found another one and made it work. He also tightened the other screw on the other arm of the frame without me even asking. Frankly, I didn’t even know it was loose. Drew definitely puts customer service first and I really appreciate that. Sometimes you walk into a shop, and no one even acknowledges your presence. That will NEVER happen in Drew’s store. Definitely come into this shop for whatever repair you may need, or even if you need a new pair of glasses. I had a pair of Dior eyeglasses that had broken hitting the ground after I accidentally dropped it one night. 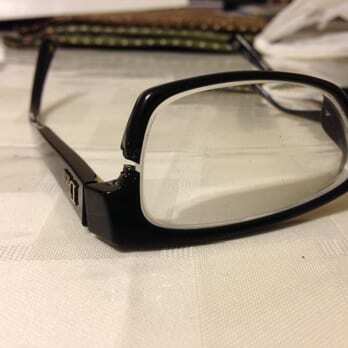 It had completely cracked right on the rim of the glasses where the lens fits in. I went store to store all over New York City to find an eyeglass technician that can fix it, but they all said it was a lost cause due to the position of the crack. I even contacted notable companies who are supposedly “experts” in fixing glasses and still had no luck. Just my luck that I found See World Optics while searching for eyeglasses stores near my house! At first, Drew took a look at my glasses and said what I’ve heard a million times already, that it’s probably not salvageable. But! The difference is, he says “…but I can try and see what I can do.” And man did he do his magic! I left them with him and within a day’s time he was able to fix them! Seriously…Brand as NEW (if not better)! After wearing them now for a few months, I have to say it’s even stronger than what it was before! He’s absolutely amazing!! And what’s more…the price was incredibly reasonable! Drew truly is an expert eyeglass technician, loves what he does, honest…one you can really put your trust in. I loved those glasses and he knew it, which is why he went out of his way to try and help me revive them any way possible. I can’t say enough about how incredible See World Optics is. If you don’t give them a try, you truly are missing out! Cracked at rim, but fixed! I don’t really write many reviews, but I feel like I would be doing everyone a great disservice if I didn’t write one for Drew and Seeworld. I had the good fortune of finding Seeworld by accident through an online search, and I am SO glad I did. I was tired of going to the big stores like Pearle Vision and getting ripped off and treated like cattle. There aren’t enough good things I can say about Drew and his business. Drew isn’t looking to make a quick buck off of every person that comes in. He is the type of professional that focuses more on making a customer for life, treating us more like family and friends rather than customers. When I lost my glasses recently, I went to Seeworld (called Drew and he told me to come right in!) and he made sure that I purchased quality glasses at a very good price. No upselling, nothing. He was more concerned with making sure I was happy with the fit and look of my glasses, and jumped through hoops to make sure I got them as fast as possible……he made me one backup pair on the spot so that I would at least have something and not drive around like Mr. Magoo, and my main pair was ready in less than 24 hours! He is friendly, patient, professional, and VERY honest, which is a rarity nowadays. He has gone above and beyond for me every single time I’ve visited him, providing a world class level of customer service that in my experience is unmatched by far. His “bedside manner” is absolutely unparalleled and I would highly recommend him to anyone without any sort of reservation. Just go there once and you’ll see what I mean! As long as Seeworld is in business and I need glasses, there is absolutely nowhere else I would go for, hands down. Drew has done it again. I now live in Portland Oregon. After groggily leaving home in the wee-hours of morning, I headed up to Bremerton, Washington (a 3.5 hr drive) for the sake of a Roller Derby tournament. It was with utter horror that I realized upon arriving at my first game of the day that I’d left my contact lenses at home. I knew I wouldn’t be able to make it through the day wearing my stylish chunky plastic glasses (from See World naturally) and that I’d be a danger to all on the track if I skated blind. I called Drew in a panic to see if he could get my lens prescription up to a local shop in hopes of being fitted-on-the-fly with new lenses. Though See World is always busy on a Saturday, he took time out to make it happen. Unbelievable! See World really is the best, and I appreciate it just as much even living here.